Gathered together, the poems of Frank Bidart perform one of the most remarkable transmutations of the body into language in contemporary literature. His pages represent the human voice in all its extreme registers, whether it's that of the child-murderer Herbert White, the obsessive anorexic Ellen West, the tormented genius Vaslav Nijinsky, or the poet's own. And in that embodiment is a transgressive empathy, one that recognises our wild appetites, the monsters, the misfits, the misunderstood among us and inside us. Few writers have so willingly ventured to the dark places of the human psyche and allowed themselves to be stripped bare on the page with such candor and vulnerability. Over the past half century, Bidart has done nothing less than invent a poetics commensurate with the chaos and appetites of our experience. 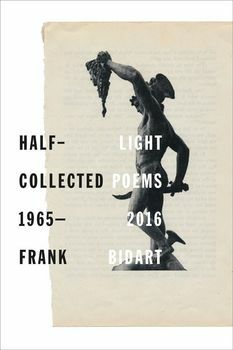 Half-Light encompasses all of Bidart's previous books, and also includes a new collection, Thirst, in which the poet austerely surveys his life, laying it plain for us before venturing into something new and unknown. Here Bidart finds himself a "Creature coterminous with thirst," still longing, still searching in himself, one of the "queers of the universe." Visionary and revelatory, intimate and unguarded, Bidart's collected works are a radical confrontation with human nature, a conflict eternally renewed and reframed, restless line by restless line. The collected works of one of contemporary poetry's most original voices.